From ancient civilizations to the present day, bracelets have been one of the most popular forms of adornment. In addition to their role as decorative ornaments throughout history, they have served as protection, objects of religious significance, and expressions of wealth and power. I like to wear this type of jewelry simply because it’s perfect for warmer weather, when my wrists are bared by shorter-sleeved garments. 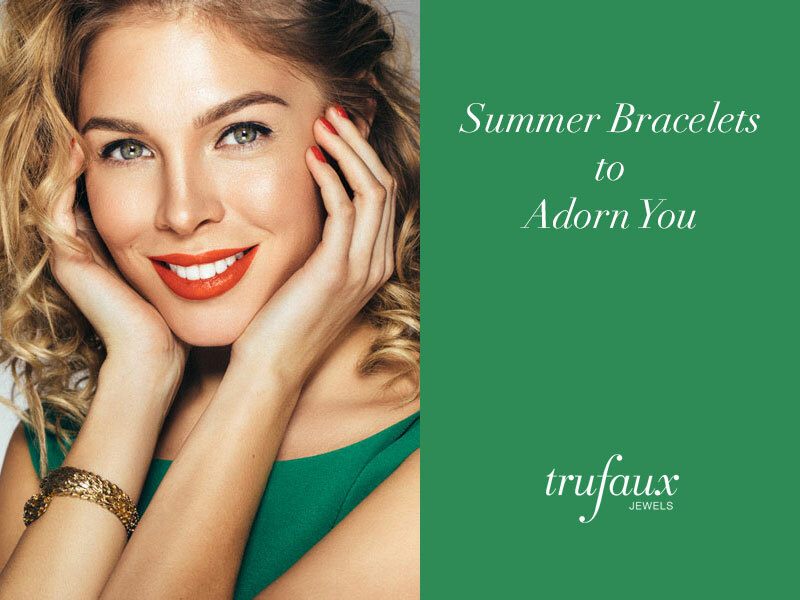 This month’s styling tips show you how summer bracelets can add style to outfits in different color palettes. I hope these examples inspire you to create your own special look with vintage bracelets. If you’ve experienced seasonal color analysis or read my article How to Find Your Best Colors, you know about warm and cool color palettes. Autumn and Spring are the Warm seasons; Winter and Summer are cool. Let me illustrate further with outfits for casual, office, and evening wear. Autumns wear deep or muted colors with a gold undertone; Spring’s light and bright colors have a yellow undertone. Here is a warm bracelet styled three ways in colors that both seasons share. This Tortoise-shell Bakelite Crescent Bracelet has three rows of links in a variation of the tank-track pattern. It was popular in the 1930s, when this piece was made. Let me show you how to wear it for a variety of occasions. 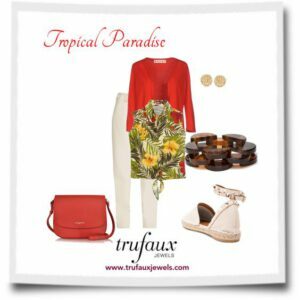 Tropical Paradise shows this bracelet with a chic-casual outfit of trousers, print blouse, and sweater. The cardigan has bracelet-length sleeves, which are perfect when you want to cover your arms while revealing an adorned wrist. These clothes and accessories are colorful and playful. 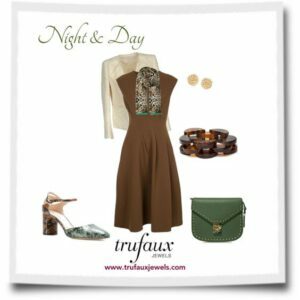 Night & Day is a dressier ensemble – for work or evening out – with the same bracelet. Here brown and green are the dominant colors, with a cream-colored blazer. When sleeves are long, I just fold them back to show off my jeweled wrist. I chose Past & Present for an office-appropriate and/or smart-casual look. This time I’ve paired trousers and shoes in navy blue (which is right for both warm and cool palettes) with shades of gold and brown. 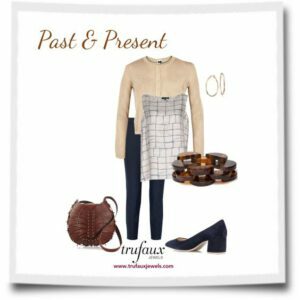 For more examples of this bracelet and others styled with outfits in warm colors, click through to see my collection. Winter and Summer are the Cool seasons. Both look best in colors with blue undertones. Winter’s are vivid (high intensity), while Summer’s are muted (low intensity). These outfits feature the same cool bracelet styled three ways, with clothing and accessories in hues that both seasons share. 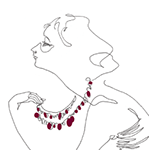 For these ensembles, I’ve chosen this Ruby, Crystal & Sterling Bangle. It has faceted square-cut red glass stones alternating with crystal ones. An Art Deco piece made in the 1920s, this bracelet is timeless and versatile. Let me show you three ways to wear it. The first ensemble – 60-Second Style – features wide-leg, black-and-white check trousers with a black v-neck top, silver sandals, and red bag. I’ve chosen these pieces to play up the lines in the bracelet. It’s an easy way to add chic to a casual outfit. 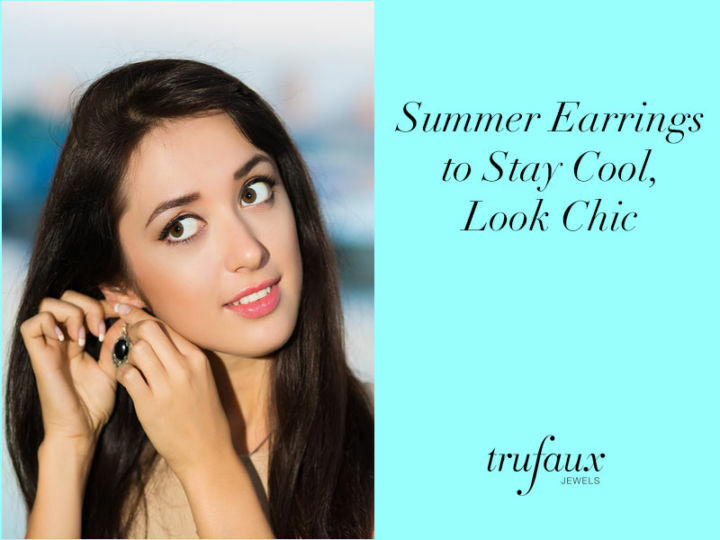 If you wear earrings, faux or real diamond studs are the easiest complement. 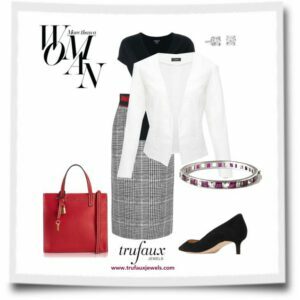 More Than a Women shows a dressier look, with a grey-and-white pencil skirt in a Glen Plaid pattern. I’ve added a v-neck top with an open v-neck white blazer, pointy-toe black kitten heels and a red bag. (Ok, I admit that I have a thing for red bags!) Again, I’ve used diamond studs. 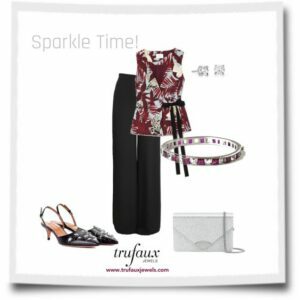 For a evening out, try something like Sparkle Time! I’ve paired wide-leg, black silk trousers with a lovely v-neck wrap top in a pattern of burgundy, pale blue and white. Pointy-toed, black sling-back shoes embellished with stars and a silver bag complete this ensemble. Diamond studs (real or faux) add another touch of sparkle. You can see more examples of this summer bracelet and others styled with outfits in cool colors here. Dear Barbara… Your styling is exquisite! I like Past and Present very much because I was looking to style a window pane black and white blouse. It gives me inspiration. I also like “60 second style” for the pants, and top with the bracelet. Thank you and keep up the good work! Thanks so much for your comments, Patsy. I, too, particularly like the outfits you mentioned. Actually, putting together these ensembles was really fun.